The usual way robotics is taught – and nearly everything, for that matter – is simple. A teacher gets a pre-built module or kit, teaches the students how to use the kit, and class is adjourned. There are significant and obvious drawbacks to this. [Kevin Harrington]’s entry for the Hackaday Prize turns that pedagogy on its head. It’s a robotics development platform that encourages everyone to create their own robots from scratch, starting with the question, ‘how many legs do you want your robot to have’. Bowler Studio uses OpenCV for image processing, a kinematics engine, a JCSG-based CAD and 3D modeling engine to interface with motors, create 3D models according to kinematic models, feed imaging data to a robot, and create graphical interfaces for robots. It’s an entire robotics creation studio in a single package, and of course everything can be backed up to the cloud. The electronic backbone is another one of [Kevin] and Neuron Robotics’ projects, DyIO, a USB peripheral that makes for a great robotics platform. The DyIO can control up to 24 servos, enough for a very, very complex robot, and also has the ability to control motors, read encoders, or just blink pins. [Kevin] wrote in to tell us about the robotics development platform he’s been working on for the last few years. He calls his device the DyIO, and looks like an extremely easy way to get a robot up and running quickly. Because the DyIO stands for Dynamic Input & Output, [Kevin] thought it was important to put 24 separate IO pins in his build. These pins can serve as 24 digital inputs or outputs, a few analog inputs and PWM outs, or even DC motor controls. What’s really interesting is the SDK that [Kevin] and his team chose to build. With this SDK, you can program the DyIO in Java or just about any other language you would want. Already, [Kevin] and his team have built a few interesting projects around the DyIO, like a hexapod robot and animatronic pokemon. While we’re sure something awesome beyond imagination is waiting to be built with the DyIO platform, you can check out these already-completed builds after the break. [Kevin Harrington] throws a curve ball with this skeleton in a coffin. Instead of going for the cheap scare, he conjures memories of old cartoons when the bony figure puts on a song and dance. 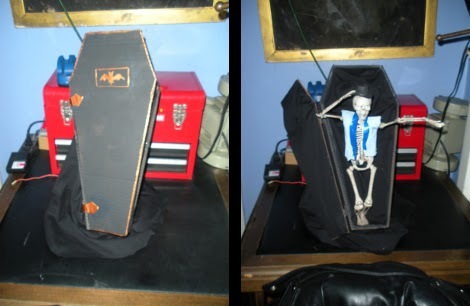 When activated it leans forward to hang out of the coffin donning a tattered tuxedo and top hat. You can hear the servos working as they give jerky yet realistic motion to the tune “Hello! Ma Baby” in the true Michigan J. Frog style. Classic! He figures it took about $36 in parts to put the skeleton together plus the DyIO module to control it from a PC. Four servos are used in total, connected to the skeleton with some steel cable. Connecting it via a computer makes it a bit easier to synchronize music with motion than just using a microcontroller capable of playing back audio would have been. Code is available from the site linked at the top, and a demo video is embedded after the break. This would also have been possible by using an Arduino as a DMX controller.